This seal is liked by those who wish to impose their will upon others. It also alleged to bring good news to the possessor. Fourth Pentacle of Saturn, "This Pentacle serveth principally for executing all the experiments and operations of ruin, destruction, and death. And when it is made in full perfection, it serveth also for those Spirits which bring news, when thou invokest them from the side of the South." Greater Key of Solomon. The image of the Fourth Pentacle of Saturn - The Hebrew words around the sides of the triangle are from Deut. Vi. 4:--'Hear, O Israel, IHVH ALHINV is IHVH AChD.' The surrounding versicle is from Psalm cix. 18:--'As he clothed himself with cursing like as with a garment, so let it come into his bowels like water, and like oil into his bones.' 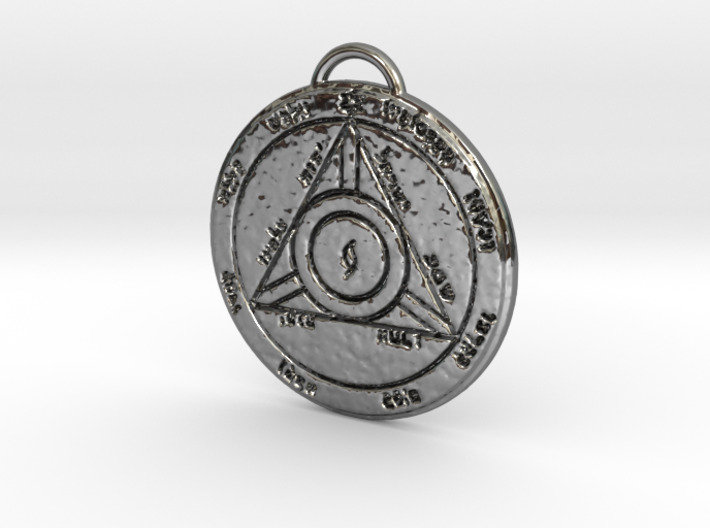 In the centre of the Pentacle is the mystic letter Yod. Mathers, trans. Greater Key of Solomon.